Google is using thousand’s factor websites ranking pages in search results. That’s why everyone doesn’t know exactly factors of ranking, and factors except Google workers who have created these factors and algorithms to improve search result. 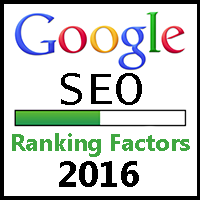 So, I decide a SEO Best list of top factors which you can use in 2016 and boost your website rank in Google search engine. The domain name also affect in SEO, if your domain name are 5 to 7 years old then you get better ranking in search results. This is really effective in the search result, because newly registered domain name are not much better than compare to old domain in the Google algorithms. The main part of the post, and important in SEO results, you must use good main keywords for your post title tag, because Google considers this to "Search Engine Result", So make your title prefect keywords. Write more than 500 word article, chances for a 2000 (words) article will be 10% higher than an article having only 500 words. Always include the keyword in (Heading 1 or Heading 2) to get better ranking in search engines. Keyword density is the number of keywords you use in your article, and the maximum limit is 2.5%, but if you use your keywords wisely in the article and keep it up to 2% or 3% then much chance to get higher in ranking search engines Google. You also add images to your articles or posts in order to get a consistent position in search engine results. Use at least one image in your post related to boost your SEO rank. If your website doesn’t have a mobile friendly version, then you are really in troubles. Make it mobile friendly, so that everybody on every device can access it easily and search engines also like this. One of the important factors for ranking your website/blog, in search engines, and Google crawlers also like to go through the entire Sitemap of your website. And the Google search engine finds batter pages to index in search result. Stop creating duplicate content in your posts, search engines don, t like copy or duplicate content. You get high rank if you create unique content in your post and Google SE, always like this. Social Media is very powerful tool of SEO, If you have more likes, shares and comments on your blog post then it will give a positive and strong social signal to Google for ranking up your content very quickly. Because these days, everyone use social network sites. Use FaceBook, Twitter, and Google Plus, to get good response of social signals. New Google algorithms named, (Penguin) are kill spam backlinks, and now you have to be very carefully creating backlinks, so always create penguin safe and well back Links. Page rank (PR) which we used to improve over time.But now, Domain Authority (DA) high with built back Links to websites which have higher domain authority than your site. That’s good if you (DA) rank above 50 or 60. Update your content every time when there is a change in the content, or in the topic you are writing about, and update your content or posts regularly. If you want verified google adsense account then order me. Account for your Websites , Blogs & YouTube. Wordpress SMS Marketing campaigns to the relative lack of competition means that in this site are Powered by WordPress and the Graphene Theme. The seo writing service is best for this blog. You will able to know about writing logs and else. This is a key project if we can do this. Awesome Article thanks for sharing blog !! SEO is a great platform for online business..wesend SMS using php to client. this is very helpful for online business.